Anyone who has ever been to a wedding can tell you that children are a welcome addition to the proceedings. We have certainly noticed this at every matrimonial event we have ever photographed as DC wedding photographers! They could be the ring-bearers, flower girls, younger siblings of the bride or groom, or children of the couple. Whatever role they play in a Washington wedding, kids brighten the entire occasion. Their presences makes everyone a little happier to be there witnessing two people tying the knot. Why is this? For starters, they tend to be pretty darn cute! Kids just have a way of making everyone around them a little happier. We have also found as award-winning DC wedding photographers that children also make matrimonial photography better. In our experience, that is because they react to everything that takes place on a wedding day genuinely and authentically. We have helped scores of couples in the Washington, DC, metro area document their nuptials on film. Along the way, we have seen many kids experience many different moments in the course of a wedding day. We have witnessed and photographed them smiling when everyone around them is happy. We have seen them laugh when something tickles their funny bone. We have observed them crying unabashedly when their mom or dad is walking down the aisle. We have seen them utterly and completely bored when there is nothing much happening of interest to them. What no Washington, DC, wedding photographer has ever witnessed, though, is a child faking an emotion. Whatever they are feeling at that particular moment is exactly what they are experiencing. They do not simulate anything, and it is rare that they experience conflicting emotions. 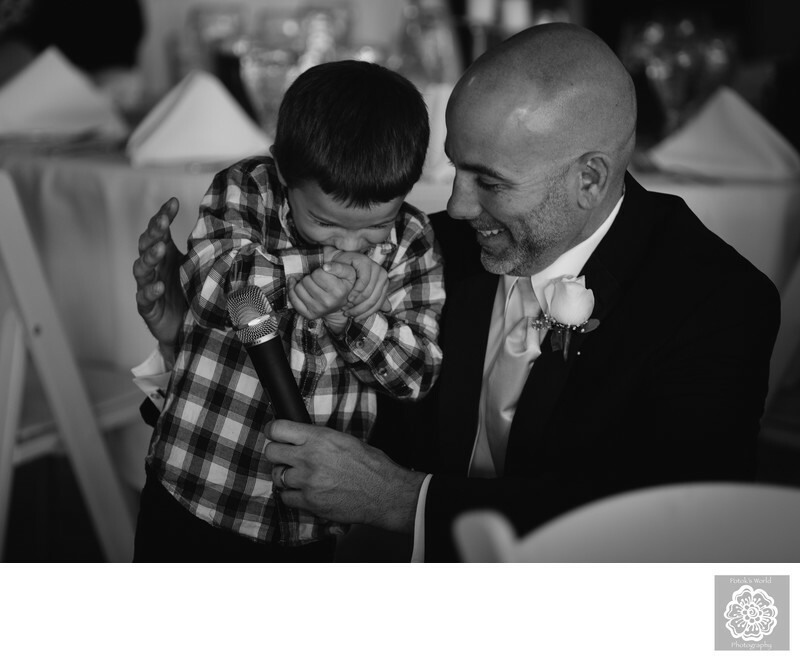 This is one reason why we love being able to capture images of kids at a wedding with emotions on their faces. If it is on the visage of a child, then it is real. That can be a very good barometer of the mood of the entire marriage celebration. If a kid is having fun and letting loose on the dance floor during the reception, then it is pretty likely that the adults are too! If the children are quiet and serious, then the nuptials are probably a lot more reserved as well. There are times, of course, when the face of a child does not tell a broader story about a DC wedding. Sometimes, a young person is just dealing with their own stuff. That was the case in this picture, for example, which was taken at the rustically elegant Rumbling Bald Resort near Asheville, North Carolina. The poor little boy in this photo was brought to the center of the dance floor during the reception. One of the groomsmen (who just happened to be his dad) asked him to say a few words of congratulations to the newlyweds. The moment was a little more than the lad could handle, though. So he buried his face in his hands to hide his embarrassment. The assembled wedding guests took great pity on the boy, of course, letting out a collective “aw” and applauding the youth for just being brave enough to be up there in the first place. Like any good Washington, DC, wedding photographers, we could tell this was a moment worth preserving on film. The bride and groom were sure to want a photograph of it to treasure forever. So we got down low and zoomed in on the boy’s face. Not too close, though, because story was not just his stage fright. His dad was leaning in to comfort him and give him encouragement at that instant. So we made sure to include him in the frame as well. Location: Rumbling Bald Resort, 112 Mountain Blvd, Lake Lure, NC 28746.